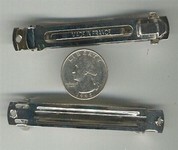 The measurement given is the length of the barrette back from end to end. You can use these barrette backs to glue, solder or sew things on to. 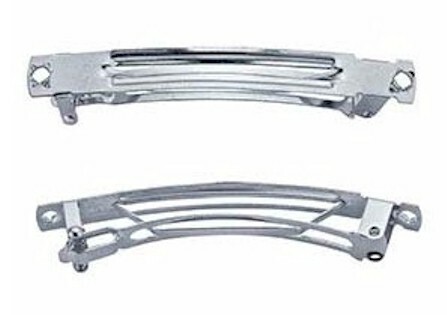 French auto-lock barrette backs are of Superior quality and meet EU Nickel directive.These have smooth rivet holes. Do not be fooled by other sellers offering very cheap "French Style" Chinese imports. These are made in France. All will be stamped "made in France" They have only two parts to them, the barrette back and the hinged clip. Chinese copies will NOT have the "made in France" stamped on them. You will find the Chinese version also have three separate parts, they tend to break and are made of a weaker steel. A: looks like 7mm wide to me.